The Yellow rat snake is mainly found in the northern parts of the hemisphere. They are considered as constrictors since this is how they kill their prey. They come from the rat snake species which is divided into several other species of which all have scientific names. The yellow rat snake is usually six to seven feel tall but is capable of growing up to ten feet. Unlike the Water Mocassin snake, the Yellow Rat snake does not process any venom in its body. Only rare cases have been reported where these snakes have been identified as having acute amounts of venom in them. They are referred to as yellow but are not really yellow. They have a dose of green and orange on their skin but the yellow is noticeable in large amounts of skin coverage thereby being identified as the Yellow Rat snake. It has thin four strips that go along the body. These strips usually vary in colour which usually depends with the region where the snake originates. The habitat of the Yellow Rat snakes is in the northern parts of the hemisphere but is also located in some parts of the United States of America. In the US they are located in coastal regions. They are also found in some parts of Europe. They live in forests with thick vegetation, swamps, hills with timber and flood-plains. In the suburbs, they can be found in buildings that have been abandoned and farms. They swim well and like dwelling in water a lot. The Yellow Rat snake is one snake that has a very particular behaviour. They remain active only at night and dusk. Depending on where they are located, they can hunt for their food in the day also. Their origination locations influence their behaviours. 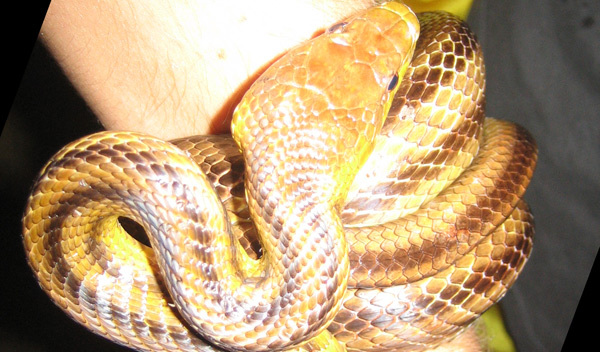 For example, Southern yellow rat snakes are very aggressive as compared to northern ones. Scientists have tried to explain this and one suggestion is that this is because of the wide variations in what they eat. Young ones can bite when provoked unlike the adults. They are aggressive when they want to eat. When yellow rat snakes is sleeping or is provoked, it goes into a position that appears curved in order to keep the predators and aggressors away. They are known as Yellow Rat snakes so the predictable diet is the rat. They also eat small chicks and birds which are small in size. Yellow rat snakes which are young eat lizards and frogs from trees. They usually swallow their prey whole. They also feed on eggs. The Yellow Rat snake usually lives for a period of twelve to twenty years depending on the habitat. Go back to the How to get rid of snakes home page.